The Lao People’s Democratic Republic has an estimated cluster munition contaminated area of greater than 800 million square metres and a CCM Article 4 deadline of 1 August 2020. During the Eighth Meeting of States Parties (CCM8MSP) in September 2018, Lao PDR informed that it would not be able to comply with the 2020 deadline and would therefore need to request an extension. The National Regulatory Authority for the UXO/Mine Action Sector (NRA) of Lao PDR held an all-day consultative workshop on 20 November in Vientiane in preparation of its Article 4 extension request due for submission in December 2018. The consultations were aimed at promoting a collaborative effort by all stakeholders in the sector in the preparation of the extension request. Participants of the workshop included representatives from the Lao MoFA, NRA, UXO Lao, the CCM ISU, UNDP, demining operators and all other actors in the mine action sector. The workshop was chaired by NRA Director General Mr. Phoukhieo Chanthrasomboun. The ISU Director, Ms. Sheila N. Mweemba, presented an overview on the Guidelines in preparing an Article 4 extension request. These Guidelines were considered and adopted at the 8MSP by CCM States Parties. Click here to view the agenda of the workshop. The ASEAN Regional Mine Action Center (ARMAC) organized a regional workshop “Enhance mine action knowledge and promote future platforms for mine action knowledge sharing for ASEAN Member States” on 12 – 14 November 2018 in Siem Reap, Cambodia, with the financial support of the Government of Canada. This workshop aimed to provide sustained platforms to share knowledge and experiences with the aims of enhancing regional capacity and cooperation, and effectively and efficiently addressing the issue of landmines, cluster munitions and other explosive remnants of war in the ASEAN region. This workshop brought together numerous speakers and participants from ASEAN Member States, donor States, the ASEAN Secretariat, ASEAN academic institutions, and organizations dealing with mine action. Topics discussed included the Sustainable Development Goals (SDGs), gender mainstreaming, and research and development in cluster munitions and mine action; clearance and risk reduction education, victim assistance, and international cooperation and assistance. The CCM ISU Director, Ms. Sheila N. Mweemba, was invited to give an overview of the implementation of the CCM and share how the Convention has contributed to global mine action. This workshop was an opportunity for the ISU to promote the universalization of the CCM to States in the ASEAN region where Convention membership is relatively low. The Swiss State Secretary, Ms. Pascale Baeriswyl, paid an official visit to the Geneva International Centre for Humanitarian Demining (GICHD) on 8 May 2018. The GICHD, therefore, organized a presentation of its activities and demonstrated its support to international humanitarian law. The Directors of the Implementation Support Units of the Convention on Cluster Munitions (CCM) and the Anti-Personnel Mine Ban Convention (APMBC) were both invited to give an introduction of their work to the State Secretary. The ISU-CCM Director, Ms. Sheila N. Mweemba, delivered an overview of the Convention, which focused on the development, achievements and current priorities of the CCM. She expressed her appreciation to Switzerland for its long-standing cooperation with the Convention and her confidence in its continuous support and fulfillment of its obligations to the treaty. The Geneva International Centre for Humanitarian Demining (GICHD) held its 5th Annual Mine Action Donor Seminar in Geneva on 24-26 April 2018. The ISU-CCM was invited to speak about the Convention during the first session of the seminar. ISU Director, Ms. Sheila Mweemba, and Implementation Support Specialist, Mr. Matthieu Laruelle, gave a presentation on the Convention focusing mainly on key milestones, achievements to date and priorities in the implementation of the Dubrovnik Action Plan. Other sessions of the seminar revolved around the themes of mine action, building national capacity, private partnerships, and donor strategies and priorities. Participants of the seminar included delegates from 8 donor States and the European Union. The ISU-CCM Director, Ms. Sheila N. Mweemba, was invited to deliver opening remarks at the Empowerment of Women through Mine Action side event organised by the Delegation of Canada and the Gender and Mine Action Programme (GMAP) in the margins of the 16th MSP of the Anti-Personnel Mine Ban Convention in Vienna on 19 December 2017. For more information on the event check the GMAP website. The Geneva International Centre for Humanitarian Demining (GICHD) held its 4th annual donor seminar on 3-5 April 2017. The sessions of the seminar revolved around mine action, building national capacity, maximising impact of mine action support, completion initiatives, and donor strategies and priorities. Participants of the seminar included delegates from major mine action donor states, the European Union, and the US Department of State Office of Weapons Removal and Abatement (WRA). UNMAS was also present at the seminar. The ISU-CCM Director, Ms. Sheila N. Mweemba, was invited to present at the seminar. On 3 April she gave an overview of the Convention on Cluster Munitions. She was also a speaker in the panel discussion on 4 April, which considered the feasibility of completing CCM Article 4 implementation by the target date of 2030 set in the political declaration adopted by States Parties at the CCM 6MSP. At its 584th meeting held on 29 March 2016 in Addis Ababa, the African Union Peace and Security Council expressed deep concern over the continued threat posed by landmines and explosive remnants of war and their devastating impact on civilians, as well as on economic development, post conflict reconstruction and regional integration. The Council welcomed the commendable progress made by Member States in clearing contaminated areas under their jurisdiction and called upon remaining Member States to spare no efforts in meeting their clearance obligations pursuant to the APMBC and the CCM. In this regard, the Council requested the Commission to assist Member States in their clearance activities, as well as facilitate the exchange of expertise and resources among them. Against this back drop, the Commission convened on 6 and 7 December 2016 a consultative meeting to facilitate consultation among Member States, international partners and implementing agencies to assess the status of implementation of article 5 of the APMBC and article 4 of the CCM in order to identify and address the key challenges facing completion. 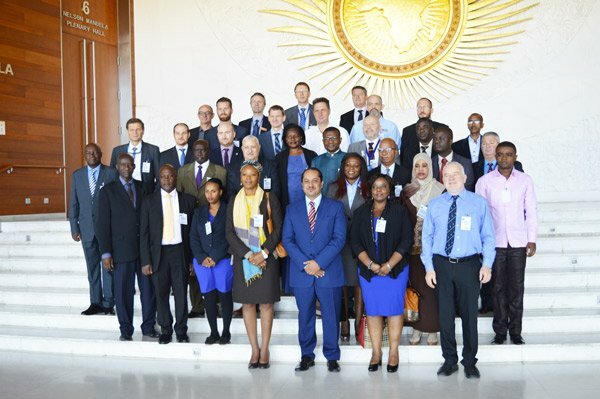 The ISU CCM Director was invited by the AU to attend the meeting and provided an overview of the current status of implementation of article 4 of the CCM in Africa and moderated sessions. For more information on the meeting. 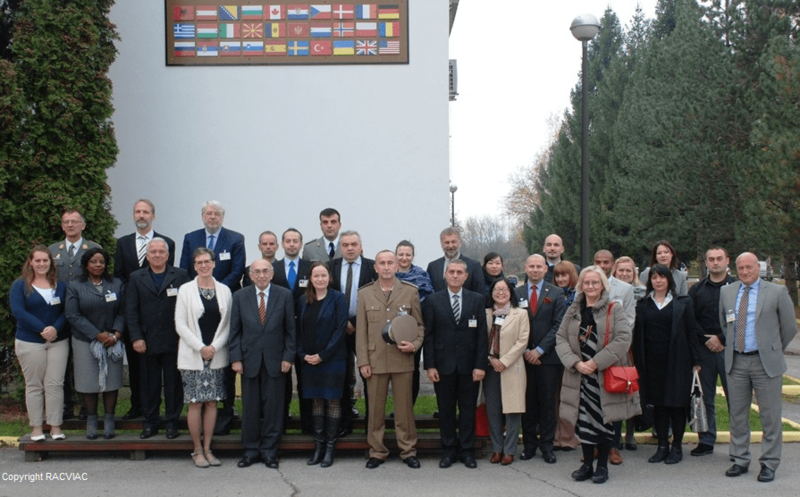 The ISU-CCM Director was invited by the Centre for Security Cooperation (RACVIAC) to participate in a 3-day seminar on the implementation of the Convention on Cluster Munitions co-organized by the Government Office for Mine Action of the Republic of Croatia. The seminar took place on 14-16 November 2016 in Rakitje, Croatia. In this context, the ISU-CCM Director made a presentation on the achievements and progress made in the implementation of the Dubrovnik Action Plan. The Director also moderated a session entitled Clearance of Cluster Munitions and its remnants in the countries of South East Europe – Mine Action’s role. During an official visit to the Geneva International Centre for Humanitarian Demining, Swiss Federal Councillor and Minister of Defence, Mr. 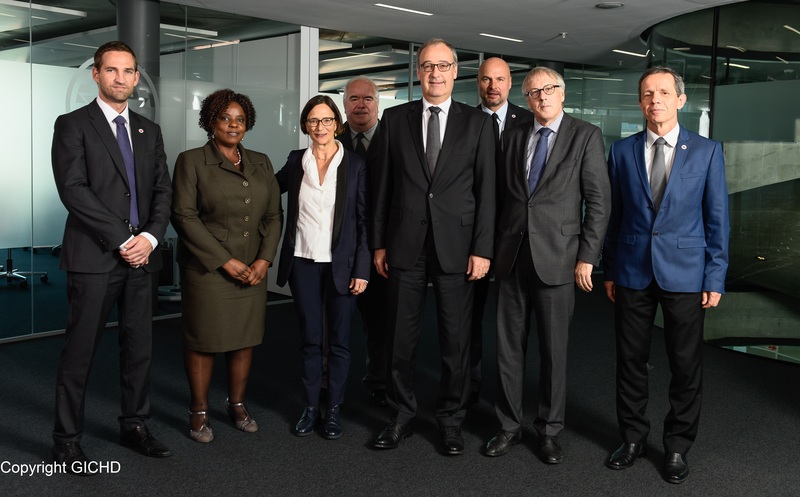 Guy Parmelin, briefly met with Ms. Mweemba, Director of the Implementation Support Unit of the Convention on Cluster Munitions (ISU-CCM). 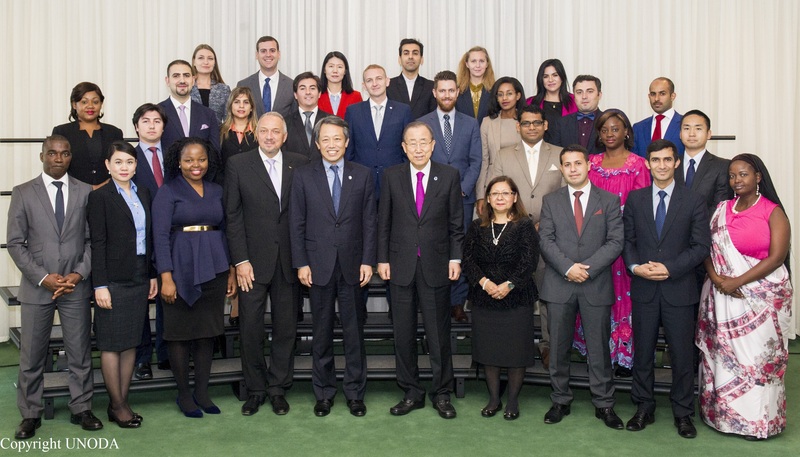 The Programme of Fellowships on Disarmament aims at the training and specialization of national officials in more Member States, particularly in the developing countries, and to enable them to participate more effectively in international deliberating and negotiating fora. The first segment of the Programme is carried out in Geneva and is aimed primarily at exposing the Fellows to multilateral negotiations on disarmament undertaken by the Conference on Disarmament or under different disarmament treaty regimes. The ISU CCM was invited by the Programme to provide a lecture on the Convention on Cluster Munitions during the first segment of the 2016 training at the Palais des Nations in Geneva.